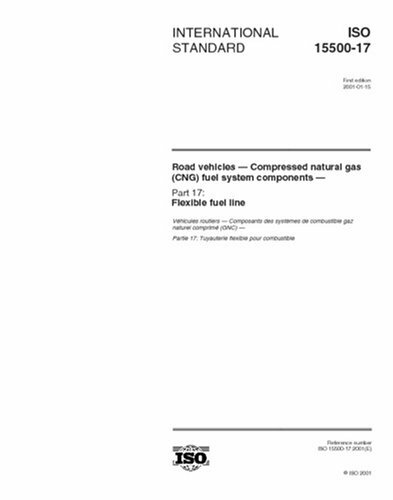 This part of ISO 15500 specifies tests and requirements for the flexible fuel line, a compressed natural gas fuel system component in accordance with SAE J 517 (100R-8 hose) or JIS B 8362 intended for use on the types of motor vehicles defined in ISO 3833.This part of ISO 15500 is applicable to vehicles using natural gas in accordance with ISO 15403 (mono-fuel, bi-fuel or dual-fuel applications). It is not applicable to the following:liquefied natural gas (LNG) fuel system components located upstream of, and including, the vaporizer; fuel containers; stationary gas engines; container mounting hardware; electronic fuel management; refuelling receptacles. This title may contain less than 24 pages of technical content.